Ancestry: Charles Pollard Handy; Lewis Handy, Capt. ; William Handy, Capt., Rev War; John Handy, Jr.; John Handy; Richard Handy; Richard Handy. Born: February 7, 1874 in Barnstable Ma. Died: August 11, 1956 in Bourne Ma. at 82 yrs, 6 mos, 4d. 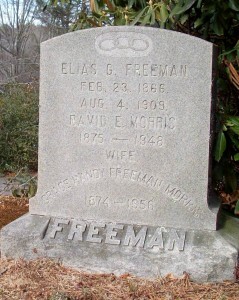 To: Elias Grimes Freeman; (1866 – 1909) (James Augustus Freeman & Matilda Grimes); Elias married (1) Ella Iles (Abt.1871 – ?) (William Iles & Phebe Speakman) in Beverly Ma. on June 27, 1893. 1. Ethel Matilda Freeman MacFarline, twin; (March 9, 1900 – ? ); Married Horace Allan MacFarline (Abt.1895 – ?) 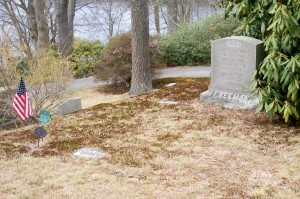 (Frederick A. MacFarline & Nettie E. Thomas) in Bridgewater Ma. on March 26, 1920. 2. Dorothy Thatcher Freeman Ward Sylvia, twin; (March 9, 1900 – January 31, 2001); Married (1) Frederick Ellis Ward (1875 – 1951) (Charles Wilson Ward, Jr. & Mary Nye Ellis) in int. June 5, 1919 & married (2) John P. Sylvia, Jr..
Married (2): January 24, 1914 in Bridgewater Ma. To: David Evans Morris; (1875 – 1948) (Maurice Morris & Elizabeth Evans); David married (1) Stella C. Beals (Abt.1884 – ?) (George G. Beals & Harriet J. French) in Whitman Ma. on June 1, 1901; David & Stella were divorced.